Amazon has just launched an official Amazon Mac Downloads Store where you can instantly buy and download a variety of Mac software and games directly from Amazon servers. The purchased Mac software is then stored on your Amazon account and you can then download as many copies for your own personal use as you want. This is an interesting move since Amazon is obviously competing directly against Apple here. While Apple may offer more titles in all, the Amazon Mac Download Store is carrying some software products that the Apple App Store doesn’t, like Microsoft Office 2011 and Adobe Photoshop Elements, both sold as heavily discounted downloads from Amazon. To celebrate the launch the the Amazon Mac Downloads Store, Amazon is including a free $5 off coupon code that can be used on any Mac game or software until June 1, 2011. To make use of the $5 off coupon, enter the code SAVE5MAC in the “Gift Cards and Promotions” box when you go to check out. 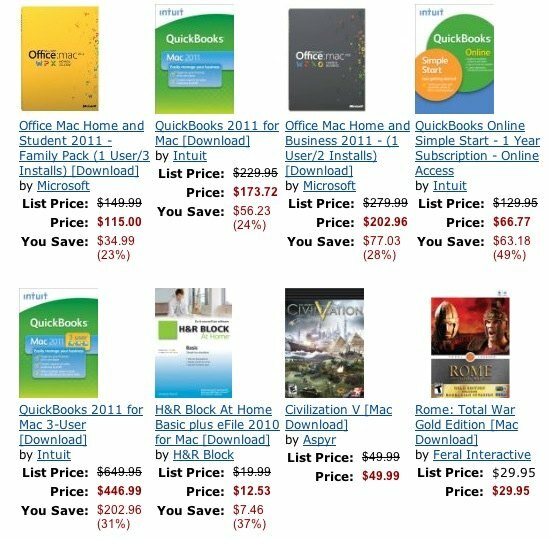 You can check out Amazon’s Mac Download Store and redeem the coupon at purchase. Free $5 off and more Mac apps to choose from? No complaints here! Likely more, but at first glance this is a good selection.